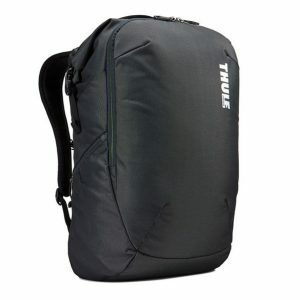 The Thule Subterra Travel Backpack provides an easy way to organize gear on the go. The versatile backpack comes with a packing cube that can be removed and even serve as a second bag, allowing users multiple sections to compartmentalize their belongings. Using the large rolltop opening and a magnetic closure, users can insert or retrieve items in the Subterra quickly. The bag’s laptop sleeve can accommodate a 15-inch MacBook Pro or a 15.6-inch PC and contains a secure flap closure, while several other smaller pockets and pen holders within the interior can hold additional gear. The Subterra also has a rear pass-through strap that makes it easy to attach to rolling luggage. The bag comes in three different size options, including a 23L, 30L and 34L version. The bags are priced at $99.95, $129.95 and $159.95, respectively.